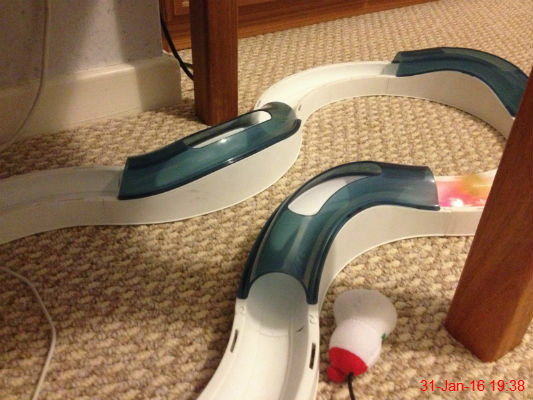 I think I should've been a cat, because I had so much fun playing with this! 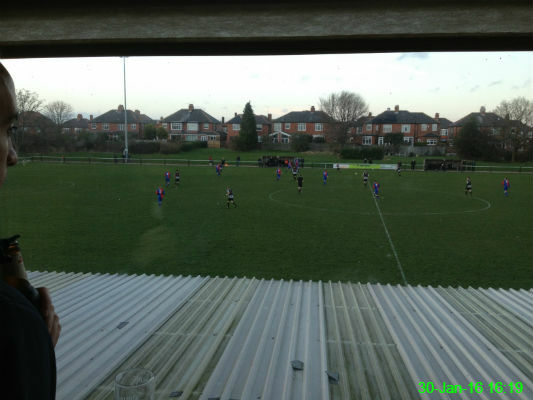 There was a fierce wind today so we watched the second half of Heaton Stannington v Tow Law from upstairs in the clubhouse. It finished 1-1 and thanks to our time in the posh seats we retained the feeling in our extremities. 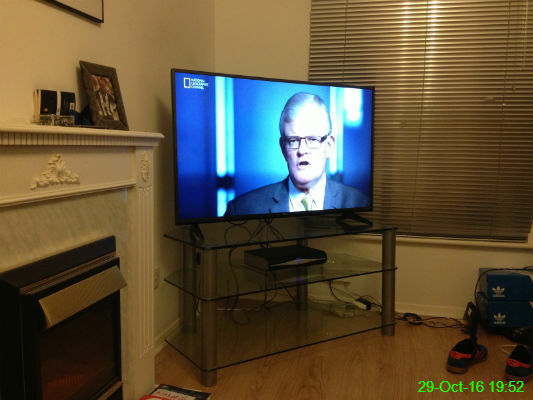 We scored for a free stand for our new television which was handy as we hadn't got round to buying one yet. It's so much nicer having it raised off the ground again! I tested it out with an episode of Air Crash Investigation, since it's only 5 weeks until my next flight. The burger chain Byron opened a restaurant in Newcastle a while ago so I went with Sara, Olwyn and Nicola to see what it was like. 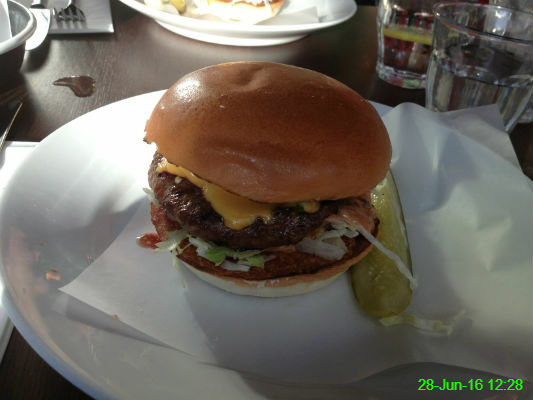 The decision was very much influenced by the 2-for-1 vouchers we had but this chilli burger was very tasty and the side dishes were nice too. 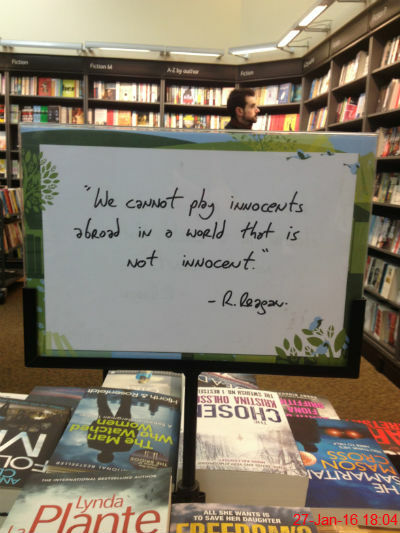 I missed the bus so wandered around Waterstones to kill time before the next one, and found myself staring reflectively at this quote for a moment. 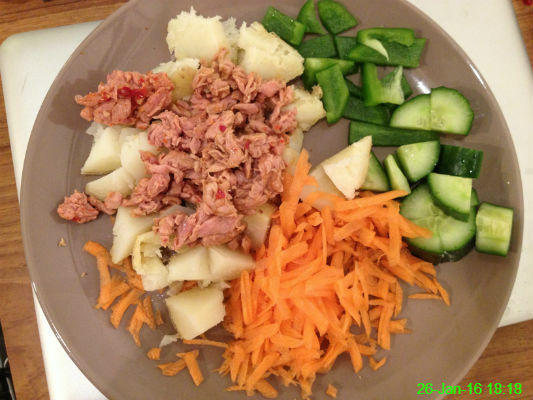 A straightforward tea tonight - baked potato, tuna and salad. 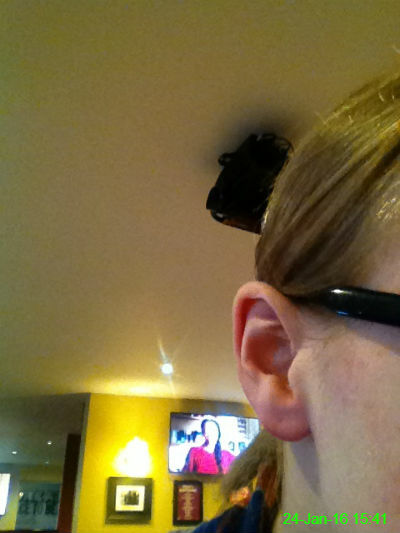 I couldn't remember if I had earlobes which are attached or detached. This photo reminded me that they are detached. 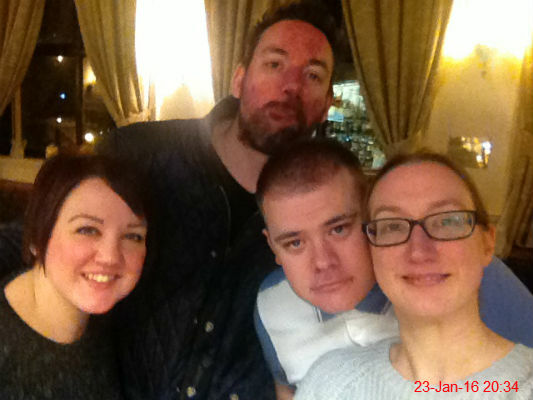 Ali, Stu, Michael and I met for Saturday drinks. It looks like the girls were more pleased about this than the boys! Sorry, more food. 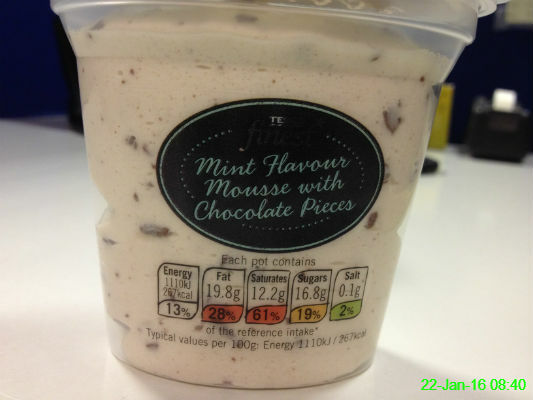 I bought this mousse to have after lunch but it was disappointing. Too much cream, not enough mint flavour. We went to The Herb Garden for a Restaurant Week pizza. I had a vegan option (but with added cheese!) 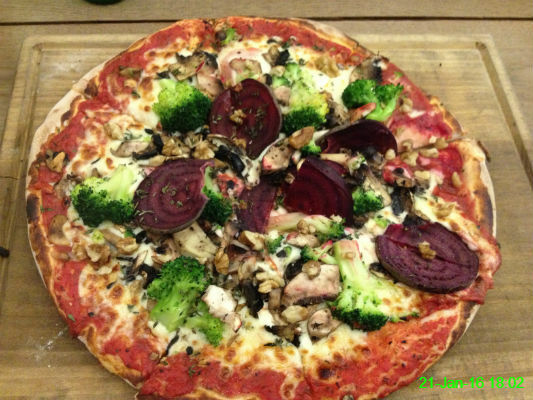 which consisted of beetroot, broccoli, mushroom and walnuts. It was absolutely lovely. 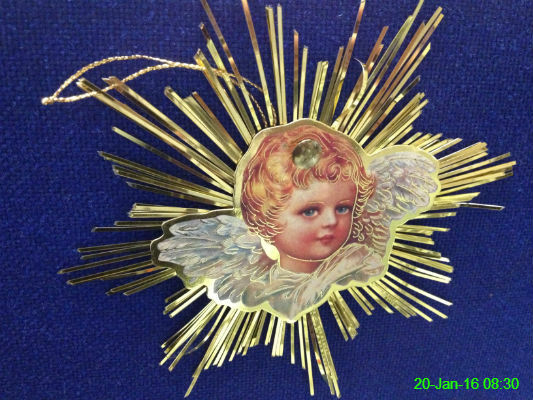 I saw this at work and mentioned how creepy I found it, so naturally a colleague relocated it to my desk. 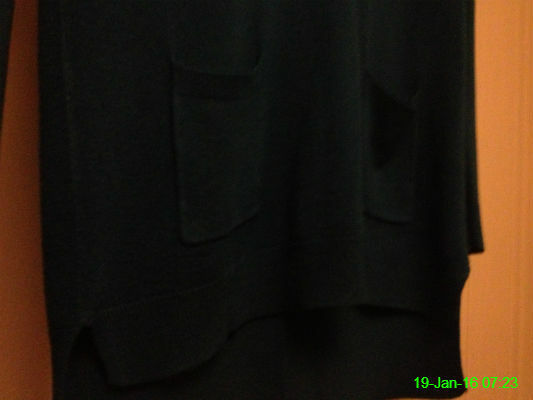 Maybe it's just because I hate Tuesdays, but when I glanced at my jumper this morning it seemed to resemble a glum face. 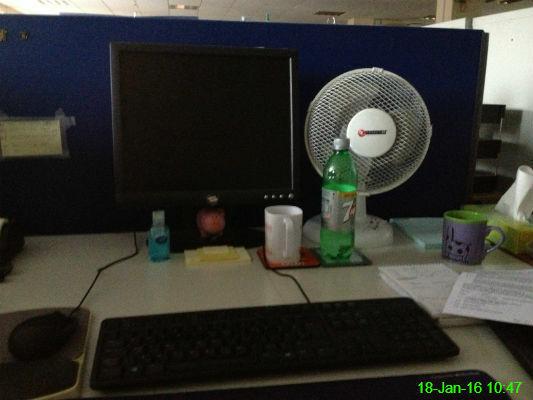 This is my desk in darkness, because we had a power cut for several hours at work today. I used to love going to Promise at Foundation in my late teens/early 20s. 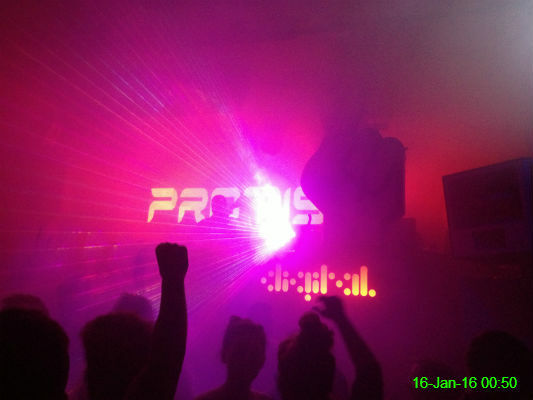 This was the relaunch at Digital with a 7 hour trance classics set from Richard Tulip. It was great to see lots of familiar faces, though I don't think my body can handle dancing for hours any more! 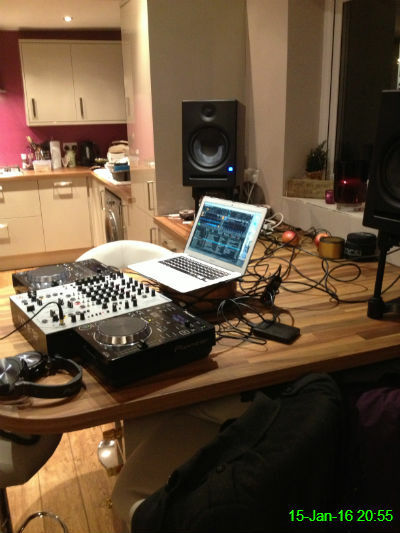 I warmed up for my first night clubbing in years with a lesson in mixing in Nasser and Sophie's new kitchen. Yesterday at work Carol said it would snow today and I said she was talking rubbish. 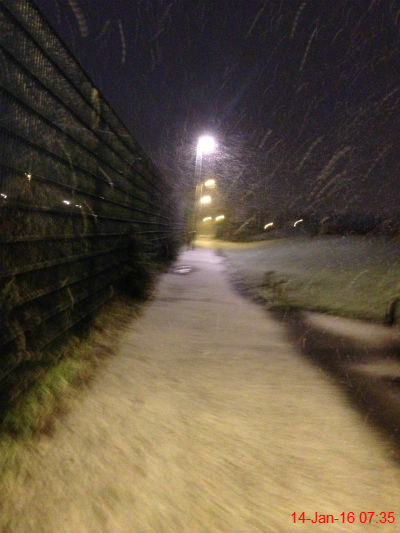 This was the moment as I hurried to the bus stop that I admitted I may have possibly been wrong. 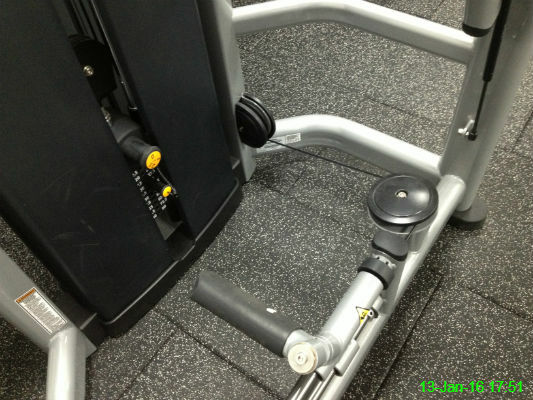 The gym has loads of new equipment, including this machine for working out your glutes. The idea is to push the pedal backwards with one foot while standing on your other leg. 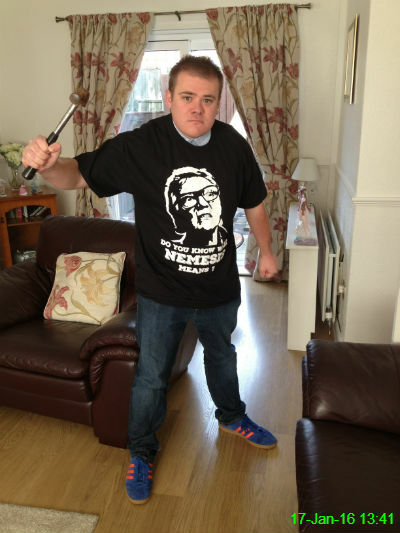 It seemed to do the trick and certainly raised my heart rate! 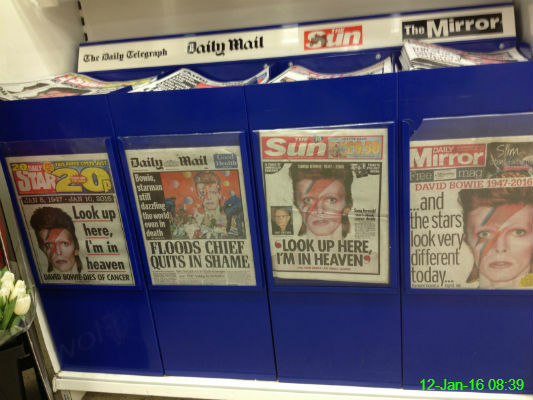 The legendary David Bowie died yesterday after an 18 month battle with cancer, so this morning's papers all had lots of coverage of the story. 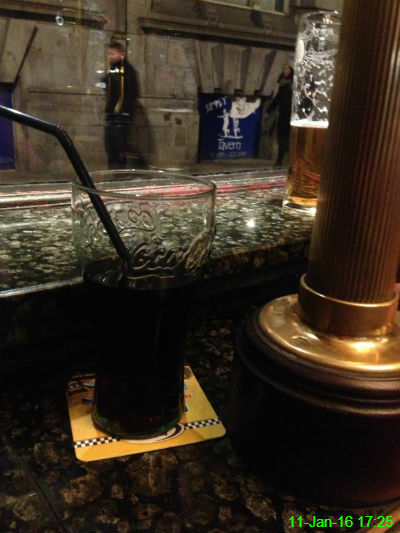 I ended up in a pub for the third day in a row, but this time it was strictly soft drinks only. 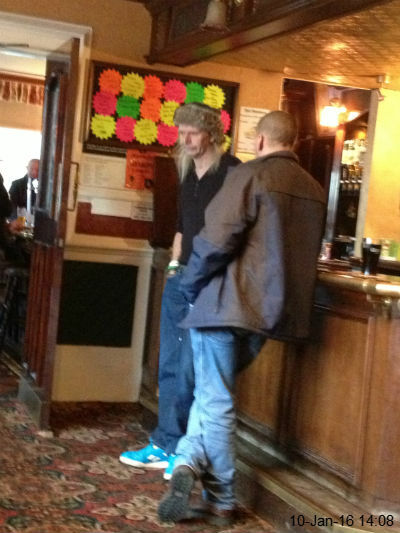 This bloke in the Camperdown looked like the film character Joe Dirt thanks to the weird hat! 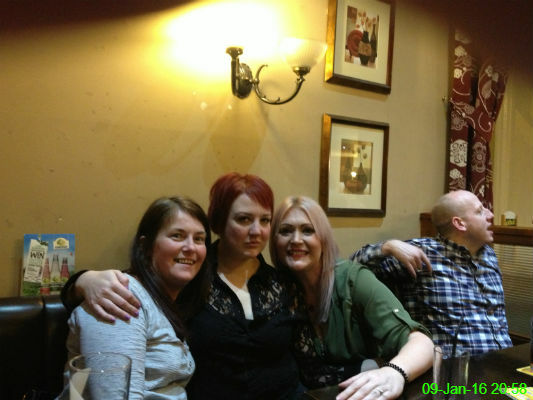 To celebrate Stu's birthday a group of us went to the Wheatsheaf. Here are Tracee, Ali and Carolyn with Steve sneaking in at the side. 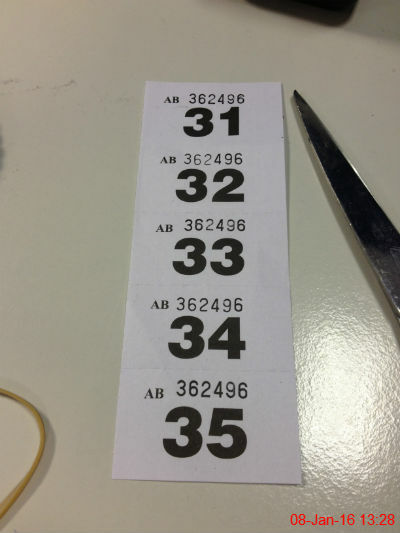 I bought a strip of tickets for a raffle at work and I'm hoping my lucky number 32 will secure the win! 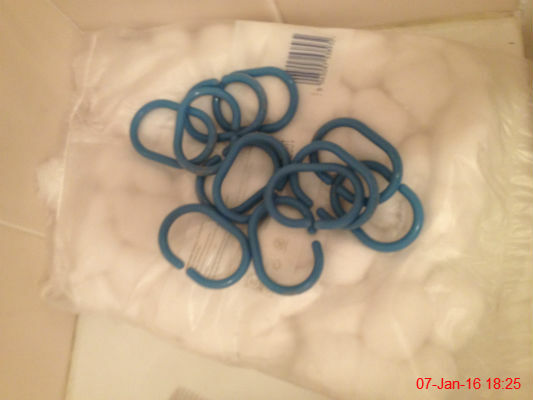 Our shower curtain rail fell down the other day, so these plastic hooks are sitting on a bed of cotton wool until we can be bothered to put it back up. It's not the most pressing task, since we don't currently have a working shower. 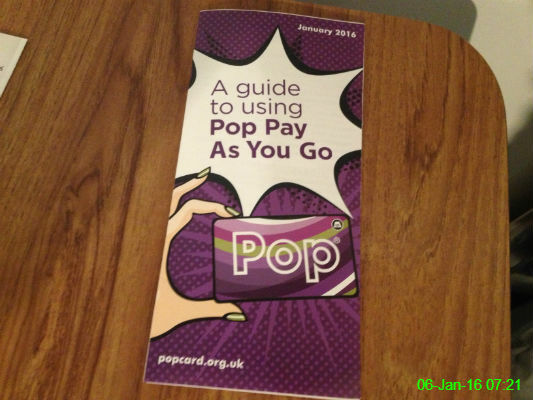 I read this leaflet about public transport while I ate breakfast. 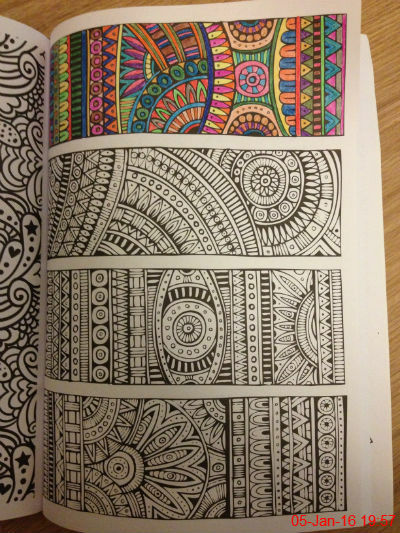 I love this pattern in the colouring book I got for Christmas so I can't wait to get it finished. I need to stop snapping my pencils though, perhaps I need a softer touch! 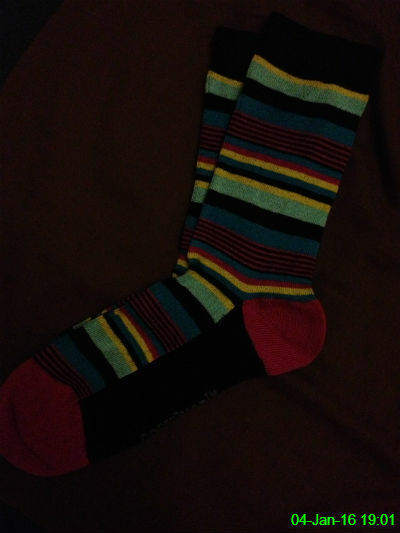 These are one of the new pairs of socks I got for Christmas. I love how snazzy they are, even with no flash on the photo! 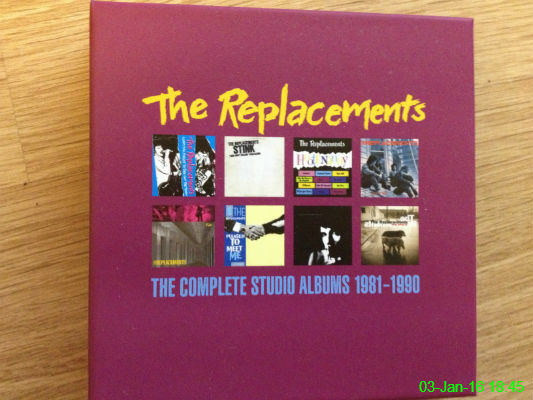 I hadn't heard of this band until recently and Dave was kind enough to pick me up the box set so I can check them out. I've only heard the first album so far but it seemed pretty good and it's nice to have some new material to get through. 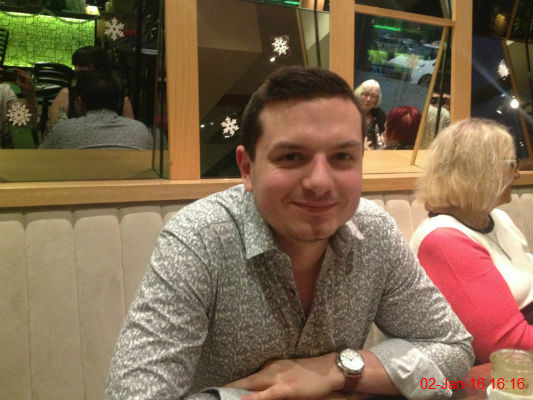 My cousin Nasser turned 30 so we had a lovely family meal at Prezzo to celebrate. Here is the bithday boy! Through clever use of bad photography and mirrors I have also managed to include parts of Sophie, Sue, Mam and Ali. 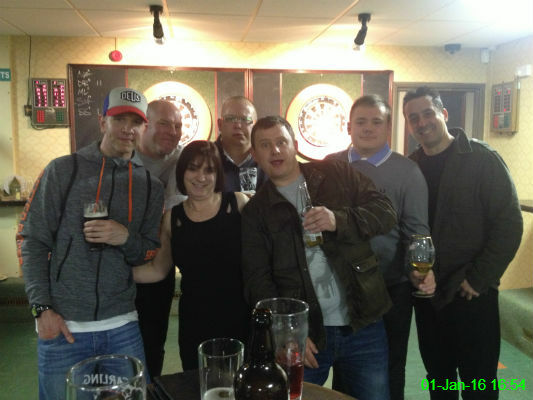 I went for New Years Day drinks at Cramlington Club with Paul, Nigel, Angela, Paul, Chris, Michael and Mark.